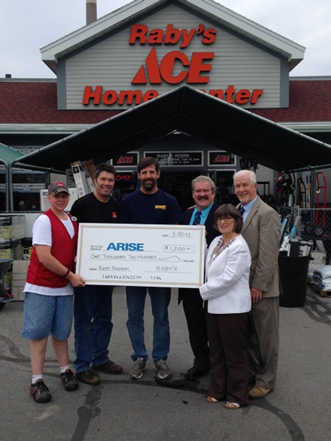 OSWEGO, NY – Demonstrating a continued commitment to the community, Raby’s Ace Home Center not only donates the hardware to the ARISE Oswego County Ramp Program to build the ramps, but they also made a generous contribution to the Program. From left are: Kyle Rookey, Peter Raby, Chris O’Brien, Jim Karasek, Tom McKeown, Sabine Ingerson. This gift will support ARISE’s work to provide ramps and other minor home access modifications to families in need. “People can feel lost when they are forced to remain in a rehab center, unable to return home because there are steps leading to your front door. Some neighbors in Oswego County are confined in their homes, unable to go out, or even to the store to get groceries. Thanks to great partners like Raby’s Ace Home Center, we are able to do something about that,” shared Jim Karasek, ARISE Manager of Independent Living Services in Oswego. “The ramps we provide keep families together or allow a loved one to return home, maintaining their freedom, their independence, and their connection to their community,” he added. The Oswego County Ramp Program receives no government funding and relies solely on support from individual and corporate donations, with help from community partners. This gift from Raby’s Ace Home Center will have a huge impact on ARISE’s ability to address the list of people waiting for ramps.